The good news about fresh mint? It tastes like summer, winter, fall and spring. Not only is it beautiful to look at, fantastic to smell, and extraordinary to cook with, this versatile herb is easy to grow and harvest. 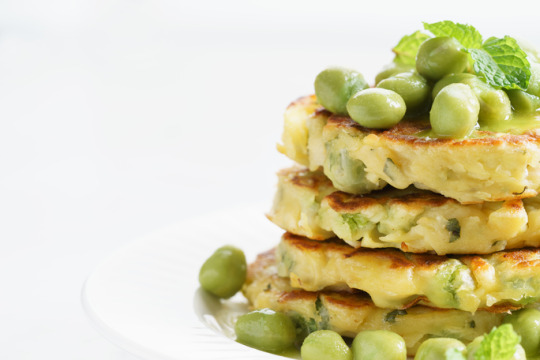 One of the best ways to use mint is to pair it with green peas. These little fritters are perfect as a side dish or a main course. If you want to serve them as appetizers, make them mini! 1. To make the fritters, place the ricotta, mint, peas, flour, salt and pepper in a large bowl and mix to combine. Whisk the egg whites and gently fold them into the ricotta and pea mixture. 2. Heat a large non-stick frying pan over medium heat, and brush with the oil. Working in batches, cook 3 tablespoon portions of the mixture for 3 minutes on each side. 3. To make the dip, mix all four ingredients together and blend well. Best if served chilled. 4. Serve the fritters with the mint dip and a lime wedge! November 28, 2017 by Corinne L.